The Kimberley is a rugged and remote region with a ‘Wet Season’ from November to April and a ‘Dry Season’ from May to October. During ‘The Wet’, temperatures range from 35o C to 45o C with very high humidity and heavy rain. These varying conditions throughout the year mean that the Kimberley and its attractions are constantly changing. It is because of this we don’t provide a day-by-day fixed itinerary, as we prefer to provide the best possible tour at the time you travel. We do fit in all the major attractions and many others, however the order or time spent in various places may change. Departing Broome at 6am we travel east along the Great Northern Highway to Derby and the beginning of the Gibb River Road. We visit Windjana Gorge and wade through Tunnel Creek before setting up the first of our bush camps. The next three days are spent exploring the rivers and gorges of the Gibb River Road. These include Lennard, Bell, Adcock, Galvans, Manning and Barnett River Gorges. 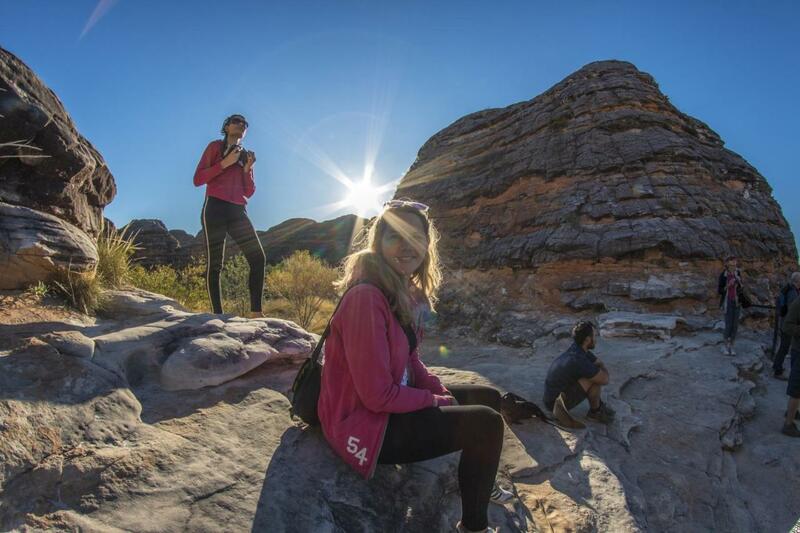 We spend our time hiking, swimming, jumping into pools, camping in spectacular locations, and viewing ancient Aboriginal Wandjina and Bradshaw rock art. Finally on the Gibb River Road we visit the Pentecost River, Cockburn Ranges and Emma Gorge (El Questro) before heading to Kununurra. The next day we travel through Turkey Creek to Purnunulu National Park, home of the Bungle Bungles, where we explore Echidna Chasm then set up camp. The next morning we hike through Cathedral Gorge, the Beehive Domes and Piccaninny Creek, then it’s off to the airstrip for optional helicopter flights over the Bungle Bungles. These are an optional extra cost and are highly recommended. After the Bungle Bungles we head back into Kununurra and out to Lake Argyle where we spend the afternoon exploring and swimming in Lake Argyle on a fantastic boat cruise before setting up camp on an exclusive island on the lake. This is regularly voted one of the tour highlights. After returning from the island the next morning we leave Western Australia, and travel through Timber Creek in the Northern Territory before setting up camp on the Victoria River. On the last day we visit Katherine Hot Springs, have a swim at Edith Falls before travelling north through Adelaide River and arrive in Darwin in the early evening.